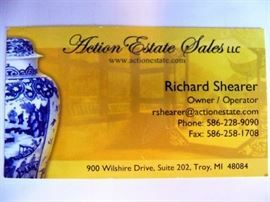 AddressThe address for this sale in Macomb, MI 48044 will be available after 6:00pm on Wednesday, May 22nd, 2019. Items sold AS-IS. Please double check items before purchasing. No returns, exchanges, or warranties. AES will pass out our place-holding tickets 30 minutes prior to opening. AES will exchange street numbers only if person is present. Cash, Check, Visa / MC / Amex / Discover/Apple Pay/Samsung Pay/ accepted with no fee to the consumer. Items available at location on sale start supersedes the photo array as evidence of what is available. We do not own the items therefore we are subject, to some degree, as to the owners ultimate actions as it relates to availability. We cannot quote prices or sizes over the phone. Enter at your own risk as we are not responsible for any accidents or injuries. We request that items located in the room with cashier not be removed, but remain in holding area until purchased. Cashier can use discretion to change pricing or refuse sale of items if price stickers have been tampered with, switched or removed. Please keep children with you at all times. Please do not bring in food or drinks. Thank you in advance for your cooperation!! We look forward to seeing you soon!